Fasting, abstaining from food accompanied by prayer and meditation, is a regular part of the Hebrew story as witnessed in the biblical text. In the Old Testament, the Jewish Queen Ester commands all Jews to observe a three-day fast in preparation for her plan to save the people. In the Acts of the Apostles, Paul, who is a devout Jew prior to his conversion, reacts instinctively with fasting and prayer to his blinding experience with the risen Christ on the road to Damascus. As the Christian church grew, the regular practice of fasting continued among the early Christians. An anonymous document know as the Didache, or The Teaching of the Apostles, from the first or second century, directs followers of Jesus to continue the regular practice of fasting on Wednesdays and Fridays, unlike the Jewish observance of the fast on Mondays and Thursdays. John Wesley, the founder of Methodism, followed the tradition of the early church and continued the spiritual practice of fasting on Wednesdays and Fridays throughout most of his adult life. Wesley believed that one can observe the fast in three ways: abstaining from food, abstaining from particular foods (such as meat), or abstaining from rich or pleasant foods (such as decadent dishes or desserts). Wesley believed that the fast is an instituted or required means of grace but one that has the potential to be abused by those seeking something other than a deeper relationship with God. Fasting is the abstention completely from one’s normal daily intake of food. 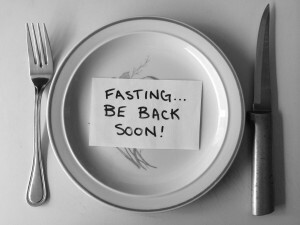 Fasting as a Christian practice does not restrict the fast to food. Fasting can also be the abstention from things that occupy time that would be better spent focused on our relationship with Christ, such as watching television, surfing the Net, or engaging in the latest gossip. Abstention in this form may be a much safer option if you are, because of medical reasons, unable to abstain from food. The object of the fast is to freetime and energy normally spent focusing on our worldly needs to focus our time and energy on our spiritual needs through practices like prayer, meditation and contemplation, or reading the Bible. Fasting should never be practiced for weight loss. Your health should never be compromised while fasting. If you have problems with your self-image or are struggling with an eating disorder, it would be better for you to fast from something else in your life, such as television, talking on the phone, a bad habit, and so forth. Observing the fast helps us to focus in times of struggle or decision, as well as times of deep spiritual or biblical study. When we are faced with a big decision or dealing with a particular issue concerning faith, observing a fast can be helpful for focusing our time and energy on prayer and meditation. Set realistic goals for yourself as you observe te fast and start slowly by abstaining from one meal or one daily habit. John Wesley observed the fast from sundown the day before until dusk on the day of his fast; for him, this constituted an entire day. The goal of going one day a week without food or a part of our daily routine is a realistic one for some. For others, fasting may be a less frequent practice. Remember that if you abstain from food during your fast, you should drink plenty of fluids like water or juice. Side effects you may experience during a fast from food include a growing stomach, hunger pains, headaches, and bad breath. Also be aware that as you observe your fast, you should not engage in any form of strenuous activity or exercise. If you are involved in any type of work, sport or hobby that requires this type of activity, observe your fast on days you do not work, practice or play. Choose days that help you stick with your commitment.